You might be forgiven for thinking that the question of how to generate more business through calling is pointless since telemarketing is dead. It’s outdated they say. It has been superseded by social media. Inbound marketing is ‘the thing’. It’s the current most effective way to generate new business. If customers come to you, ready to buy, surely that’s best thing for your business. I can’t disagree with the last point. If you can deploy an inbound marketing strategy that drives hot leads to your door, that’s certainly the way to go. In fact, whilst we don’t deploy some of the more sophisticated techniques of inbound (for example using Hubspot, Marketo, infusionsoft etc), not least since we aren’t a volume player, we wholly endorse this strategy. We’ve had great success and won terrific clients and business through effective inbound techniques such as content development and distribution on social platforms. Take a look at some of our videos, blogs, podcasts and infographics if you don’t believe me. The trouble is that, like many marketing solutions, inbound marketing is a long game and we didn’t get to over 400 Blogs, videos, infographics and the like overnight. It has taken years. Assuming that you know your target audience and what they respond to, it can work for your business. However, it does take time. It can be also argued that these activities are passive. In other words, you create stuff that people hopefully want to read and watch and then you wait. Whilst, you can target (and retarget) people on LinkedIn and elsewhere, through social advertising, direct tweets and Inmails, that also takes time. And, clever businesses use a range of measures to drum up business. They don’t rely on one technique or solution. Therefore, whilst we recommend inbound as a solution, it isn’t the only answer. 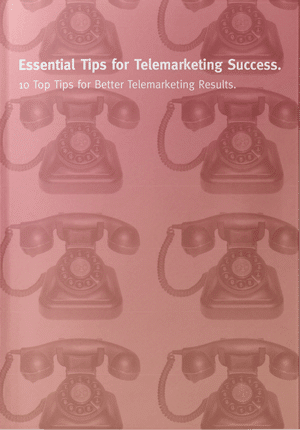 I’ve written many times before about tips on telemarketing. Check out some of the blogs and videos on rapport building, objection handling and gatekeeper techniques. Also take a look at the important topic of database marketing. There are lots of videos and articles on our site if you use the search bar or categories. I’ve devoted plenty of space in this blog to the topic of inbound marketing that should ideally run alongside any outbound activity. On that basis, we should now concentrate on how to generate more business through telemarketing if you do decide to run telemarketing activity either in house or through using an agency. In essence, it’s all about strategy. Too often, people think of telemarketing in an overly simplistic way. They think cold-calling. They think prospects only. They forget customers (cross sell, up sell, lapsed customer resuscitation etc). They never consider targeting resellers or referral business. They consider it to be hard-nosed telesales of the style of selling double glazing or PPI. Yet, effective b2b telemarketing shouldn’t be like that. There are a number of potential options when it comes to who you call and that should be your first decision point. You need to decide on your objectives. How defined are those targets? Who is the buyer? How realistic are your targets based on experience (both past campaigns and your experience in your field) and your current business status (market leader with a new innovation or a small market follower with a commoditised solution)? The level to which there is competition in the market will inevitably impact results. Whether buyers are under contract elsewhere will affect their likelihood to meet you or buy from you and the speed results will come in. Do you also understand how customers use yours and other products and services? You might have the best thing since sliced bread. However, if a lower specified and priced solution does the job and doesn’t significantly affect the customer’s day to day work, then it may be a struggle to initiate change. How many of them do you want? And how realistic is that with your budget and time allocation? Maybe you’ve used telemarketing before and have a benchmark from which to work. If not, how will you assess likely results? That’s where companies like GSA come in as we have the experience. We don’t always know 100% but we’ll give a pragmatic assessment based on the level of input. And, how urgent is the need? Often, coupled with the scale of difficultly, that will dictate the amount of time required. Data is my topic of choice at the moment for blogs and videos. Aside the fact that there are changes coming to the data protection rules and those governing marketing, it’s sensible, it’s good practice and sound marketing sense to spend time getting the data right. In the most basic terms, the poorer your data from which to make the calls, the poorer the results will be and it will take longer and cost you more. So, why wouldn’t you invest in getting data right? B2b is in a constant state of flux. It’s almost impossible to keep it clean. Many data brokers/providers claim that their data is 6 months old. Whether that’s true or not is, to some extent, immaterial. The reality is that people change jobs all the time for one reason or another. So, database management can be a losing battle. At least, it does mean that you need to seek out the best solution for data for each outbound marketing exercise. That includes your customer data as mentioned above. You can buy data from a broker or build it yourself using LinkedIn and other sources. In some cases, like construction, you can subscribe to a source like Barbour ABI or Glenigan. However, remember that you need to screen the data for opt-outs every 28 days for suppressions. Increasingly, we’re being asked to build and validate b2b data using a combination of techniques and tools since customers understand the impact in results without accurate data. That doesn’t just mean companies but decision makers. It’s all well and good having the right phone number for IBM but who do you ask for when switchboard answers? The line ‘can you put me through to the person who’s responsible for…..’ is much less effective these days especially in bigger companies where they block calls and have no name policies. Why should customers bother with you? A while ago, I wrote a blog and recorded a podcast on 5 Tips on selling yourself in addition to your services. What’s the customer’s first impression of you? Do you make an impact or would they rather watch paint dry? If you have no energy and enthusiasm, it’s hard to see how you’ll achieve your goals on the phone or face to face. What have you got that the customer wants? Why is there any urgency to meet? This last point is especially relevant if they already have supplier who may be contracted. So, what’s going to get you in the door? You might not have all the answers but you do need to work as hard as you can to come up with something. You need to tick boxes in the first few sentences on the phone with a prospective customer or they will get rid of you pretty quickly. Just because you’re good at what you do doesn’t mean customers will jump at the chance to meet you. They have competing priorities. They aren’t stupid or lazy for saying no or for procrastinating. Of course, the above doesn’t constitute everything you need to do and be successful in telemarketing. However, you certainly won’t run a successful telemarketing campaign or be successful at ongoing telemarketing without these. Telemarketing is neither outdated nor the answer to all of your lead generation questions. In an ideal world, marketing should be integrated. You should use a range of tools for your new business lead generation. Telemarketing can certainly amplify the effectiveness of other methods (e.g following up click throughs from an email exercise or after connecting on LinkedIn). Telemarketing is a proactive person to person method of marketing that can be targeted and deliver significant ROI over time. However, like most marketing tools, it will fail on all levels if you don’t spend the time to get the strategy right, work on your data and come up with a compelling reason for your customers or prospects to engage with you.